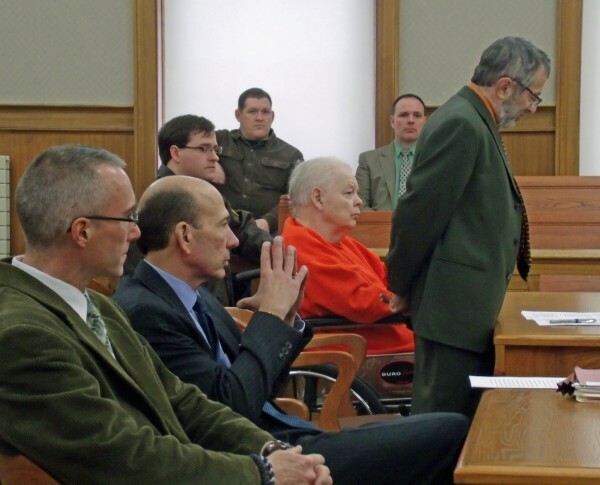 George Jaime (wearing orange) listens as his defense attorney, Jeffrey Silverstein of Bangor, argues for a new trial in Aroostook County Superior Court in Houlton on Friday, Dec. 20, 2013. Jaime, 76, was sentenced to 40 years in prison for the intentional and knowing murder of Starlette Vining, who was 38 years old when she was last seen alive in October 1998. Her body was never found. At the prosecution table is (at right) State Police Detective Adam Stoutamyer, the primary detective on the case, and Assistant Attorney General Andrew Benson. George Jaime sits in his wheelchair prior to sentencing in Aroostook County Superior Court in Houlton on Friday, Dec. 20, 2013. After a four-day jury trial, Jaime was found guilty of intentional and knowing murder of Starlette Vining on Nov. 15. Vining was 38 years old when she was last seen alive in October 1998. Her body was never found. Jaime was sentenced to 40 years in prison. 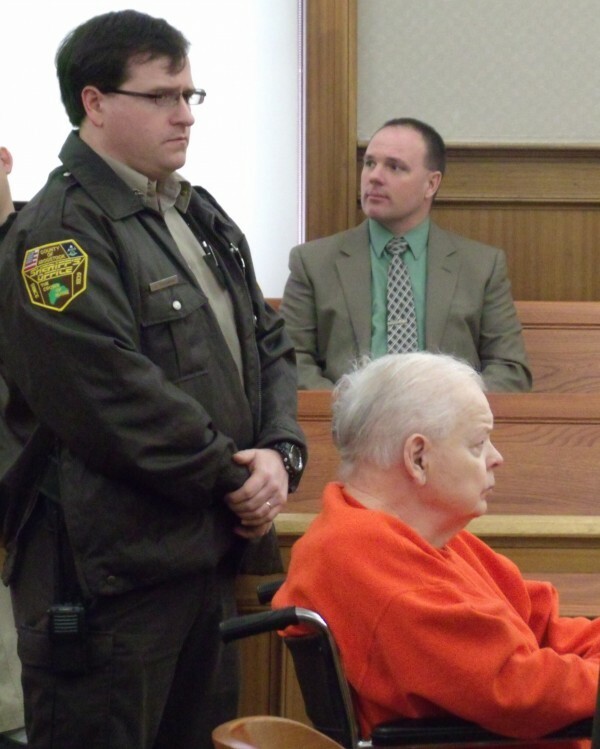 HOULTON, Maine — A Presque Isle pawn shop owner found guilty last month of stabbing and beating to death his live-in girlfriend in a drunken rage 15 years ago will die in jail for his crimes. George Jaime, 76, will spend the next 40 years in prison for the intentional and knowing murder of Starlette Vining, who was 38 years old when she was last seen alive in October 1998. Her body was never found, but Jaime was convicted of her murder on Nov. 15 after a four-day jury trial before Justice Robert Murray in Aroostook County Superior Court in Houlton. Jaime appeared in court Friday in his wheelchair, no longer in the blue suit he wore during the trial. It had been swapped for a bright orange sweatsuit and matching shoes. The killer’s son, Ted Jaime, and his friend, James Campbell, both testified during the trial that George Jaime told them he stabbed Vining to death, dismembered her body and incinerated it in a commercial furnace in the basement of the pawn shop and apartment complex he owned on Main Street in Presque Isle. Ted Jaime also testified he saw Vining’s corpse in his father’s apartment, and both he and Campbell said they helped clean up the murder scene. Ted Jaime’s ex-wife, Parise Voisine, also said on the witness stand that her former husband told her about cleaning up the murder scene and the dismemberment. During the trial, defense attorney Jeffrey Silverstein of Bangor challenged the recollections of Ted Jaime and Campbell, pointing out that some of their accounts of what happened and details about cleaning up the crime scene did not match up. Both men also admitted to past histories of drug and alcohol abuse. Silverstein also argued that there was no evidence that Vining was dead. In court Friday, state Assistant Attorney General Andrew Benson urged Justice Murray to sentence Jaime to 55 years in prison based on a number of factors, including the degree of violence involved in Vining’s death, the fact that there was no motive and that Jaime was intoxicated at the time of the murder and committed it with a dangerous weapon. Jaime stabbed Vining repeatedly with a Marine-style KA-BAR knife, and when she wouldn’t die, he beat her with the hilt of the knife, according to testimony. “He used extreme cruelty,” said Benson, adding that Vining must have undergone “conscious suffering” when she was being beaten and stabbed to death. He also noted that Jaime has never shown any remorse. He also said that the judge should weigh how the loss of Vining will impact her family. Silverstein, after arguing unsuccessfully at the start of Friday’s proceedings on a motion for a new trial, said that he did not have a lot to say on his client’s behalf. “He stands by his innocence and says that he is not responsible for this crime,” the defense lawyer told Murray. Jaime also addressed the court briefly. Relatives of Vining were not in the courtroom but had submitted written victim impact statements to the judge. Murray said that they expressed “the river of sorrow that flows from these events” and the feelings of a daughter “who misses her mother every day,” as well as the trauma and pain that came with the years that went by without them knowing what had happened to her. Murray said when he sentenced Jaime that he took into account his age and the fact that he did not have any criminal history. At the same time, the judge said, an aggravating factor was Jaime’s lack of remorse and failure to take responsibility for the murder. Murray said that he was especially troubled by a statement that came out during Campbell’s testimony, when Campbell said that Jaime was “kind of proud” of what he had done to Vining. He also took into account the use of the weapon and the violence involved in the murder when imposing sentencing.